VIP Private Tour departing from Hua Hin, Thailand. 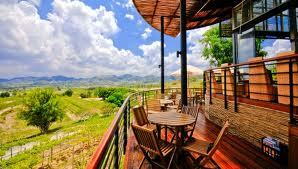 Hua Hin Hills Vineyard and Thai Wine tasting Tour. 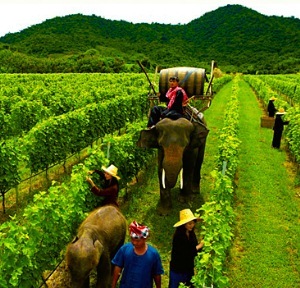 Thailand white and red wines, Lunch at the vineyards beautifully scenic restaurant, After lunch take an Elephant ride through the vineyard. 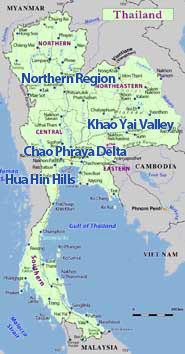 Hua Hin Hills Vineyard is built on a former Elephant coral, a quiet place where wild Asian Elephants where domesticated. The terrain of loamy sand and slate and consistent ocean breeze allow international grape varietal to thrive and produce aromatic and award winning Monsoon Valley Wines. Siam Winery started developing the vineyard after successfully experimenting at the nearby Royal Research Station at Huay Sai in 2003. Today you can explore the Vineyard and taste the New Latitude Wines at the Sala Wine Bar and Bistro. A visit to the Hua Hin Hills Vineyard affords you the luxury of basking in the costal sunshine where you will learn more about viticulture and oenology while admiring the plush 200 rai Vineyard. The Sala is an enchanting Thai inspired pavilion, designed by Ms Sylvia Soh, a former Norman Foster architect, serves as the platform for providing information on the Vineyards and Thai Wines. The Sala combines local elements with contemporary designs to afford visitors a soothing and enlightening experience. Housed within is a trove of information on New Latitude Wines waiting to be explored. The Sala includes a Wine Bar and Bistro, retail shop, wine cellar and meeting facility.